1903-1909 autograph album of Clarence Frank Bridge of Nelson, New Hampshire. Because he was a child during this time frame, it's likely that his mother collected most of the sentiments for him. 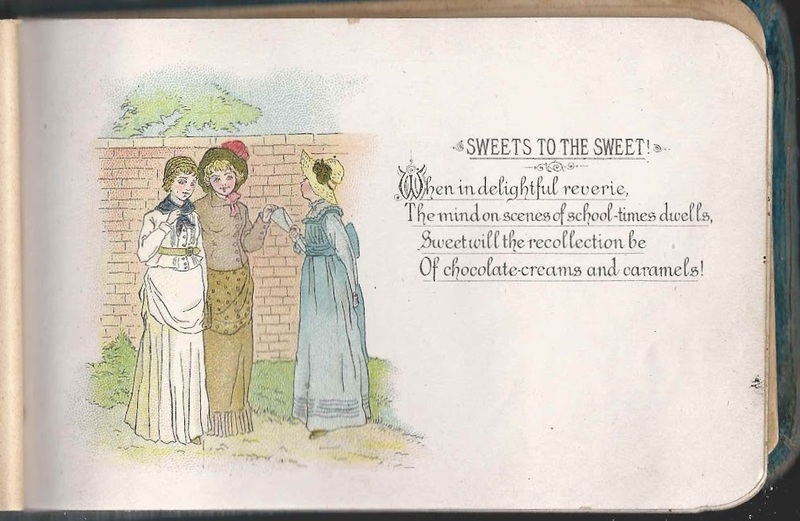 The album is approximately 5-3/4" x 3-3/4" and contains the sentiments of 18 of Clarence's relatives, friends, schoolmates and teacher. An alphabetical surname list and an alphabetical list of the signers, together with any personal information they offered, appear at the end of this post. 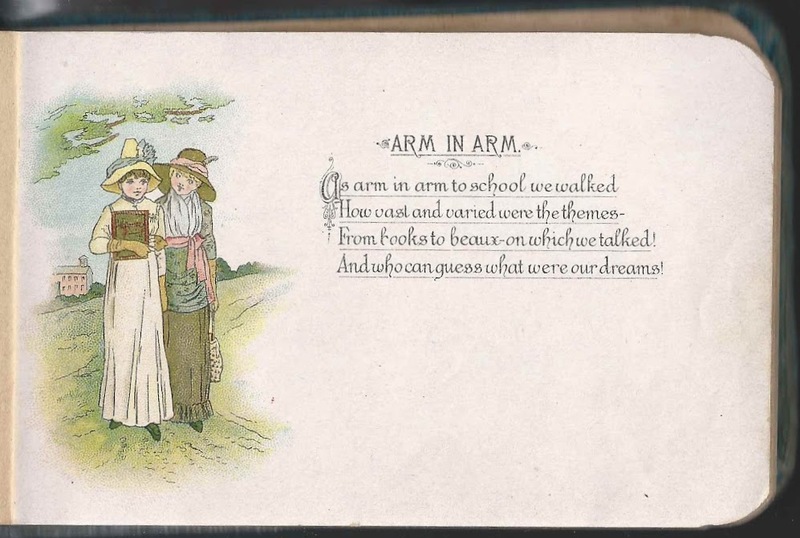 There are several illustrations scattered throughout, of a feminine vein, which seems odd for an autograph album for a boy. Clarence Frank Bridge was born 5 February 1897 at Sullivan, New Hampshire, the son of Frank Wilbur Bridge and Hattie Anna (Dunn) Bridge, who were born at Roxbury, New Hampshire, and Sullivan, New Hampshire, respectively. Hattie Anna (Dunn) Bridge signed a page in Clarence's album at Nelson, New Hampshire, on October 10, 1903. Clarence's sister Alice Dora Bridge of East Sullivan, New Hampshire, signed a page on September 20, 1902. Interestingly, Alice's future husband apparently sought out her page on their wedding day, January 2, 1909, and signed the right facing page. Several of Clarence's relatives on his mother's side signed pages in his album, including her brother Reuben Austin Dunn and his wife Amanda Elizabeth Dunn and their children, Arthur Garfield Dunn, Mary Ada Dunn, "Mae", and Bessie Ella Dunn. Another of Clarence's cousins who signed a page in his album was Hattie Cornelia Currier, daughter of John Sumner Currier and Hannah Cornelia (Dunn) Currier, who was a sister to Clarence's mother Hattie Anna (Dunn) Bridge. 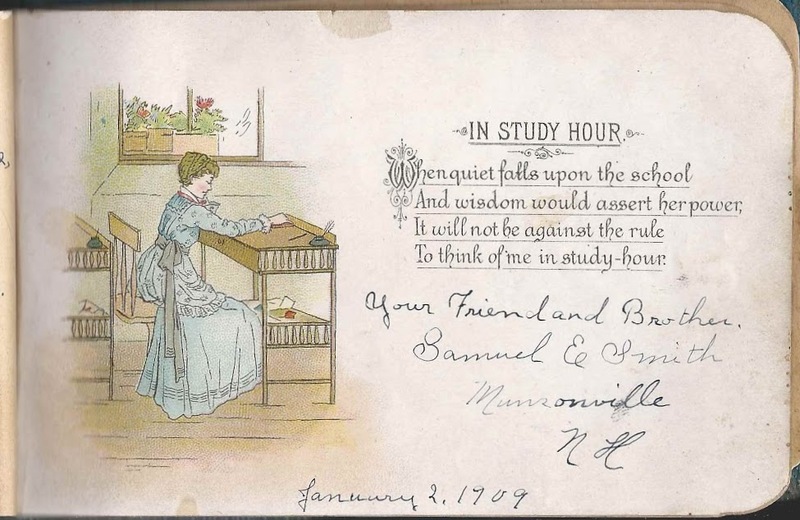 The teacher who signed a page in the album was Maude A. Styles of Peterborough, New Hampshire, who signed her page at Munsonville, New Hampshire, on May 20, 1904. She was the daughter of John E. and Amelia Delora (Stone) Styles. She would marry Swedish immigrant Emil Erickson in 1920. On November 24, 1921 at Keene, New Hampshire, Clarence Frank Bridge married Dorris Lula Hill, daughter of Daniel L. and Lula G. (Hodgman) Hill. They would have three children before Clarence's untimely death from pneumonia at Keene, New Hampshire, in 1926. Dorris later married Neil Vernon Metcalf and had at least one more child. Hattie A. Bridge of Nelson, New Hampshire, signed on October 10, 1903. Hattie Anna (Dunn) Bridge, mother of album owner Clarence Frank Bridge. 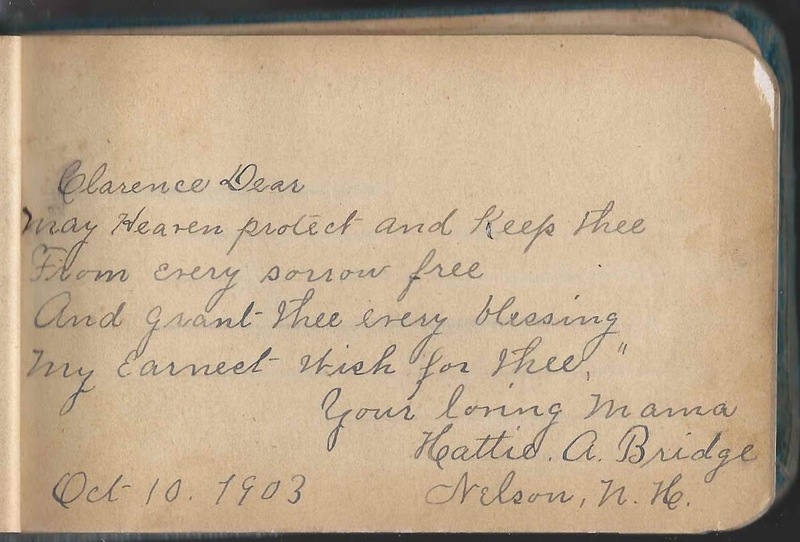 Alice D. Bridge of East Sullivan, New Hampshire, signed on September 20, 1902; "From your loving Sister". She was Alice Dora Bridge, Clarence's older sister. Her future husband, Samuel E. Smith, signed the right facing page after their 1909 marriage. Hattie Currier of East Sullivan, New Hampshire; Clarence's cousin. She was Hattie Cornelia Currier, daughter of John Sumner Currier and Hannah Cornelia (Dunn) Currier, who was a sister to Clarence's mother Hattie Ann (Dunn) Bridge. Bessie E. Dunn, signed at Harrisville, New Hampshire, on November 26, 1903 [Thanksgiving]; Bessie Ella Dunn, Clarence's cousin, daughter of Reuben Austin Dunn, a brother of Clarence's mother Hattie Anna (Dunn) Bridge. Mr. R. A. Dunn of Harrisville, New Hampshire, signed on November 27, 1903. He was Reuben Austin Dunn, a brother to Clarence's mother Hattie Anna (Dunn) Bridge. 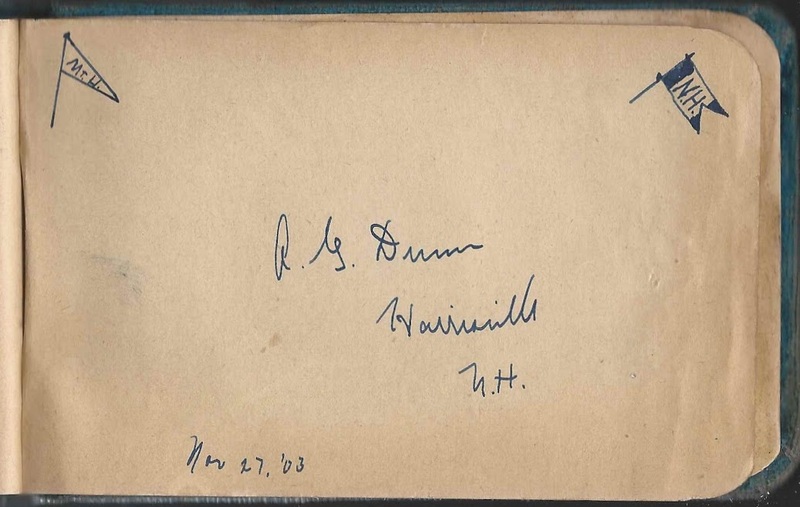 Reuben's wife Amanda Elizabeth (Farwell) Dunn signed the right facing page. A. E. Dunn of Harrisville, New Hampshire, signed on November 26, 1903. She was Amanda Elizabeth (Farwell) Dunn, whose husband Reuben Austin Dunn signed the left facing page. Reuben was a brother to Clarence's mother Hattie Anna (Dunn) Bridge. George C. Hudson, signed on June 5, 1903; "your playmate"
Marguerite Page of Munsonville, New Hampshire, signed on October 24, 1903 (perhaps in her mother's handwriting); "your schoolmate"
Samuel E. Smith of Munsonville, New Hampshire, signed on January 2, 1909; "Your Friend and Brother". January 2, 1909 was the day that Samuel married Alice Dora Bridge, Clarence's older sister. He chose a page facing the one signed by Alice in 1902. Maude A. Styles of Peterboro, New Hampshire, signed at Munsonville, New Hampshire, on May 20, 1904; Clarence's teacher, daughter of John E. and Amelia Delora (Stone) Styles. She would marry Swedish immigrant Emil Erickson on July 8, 1920 at Jaffrey, New Hampshire.